I am getting close to getting the painting finished. I kept thinking that I would have it finished by the end of the day but I forgot that every time I complete a section, I have to go back to a previous section to make corrections or to meld it together. 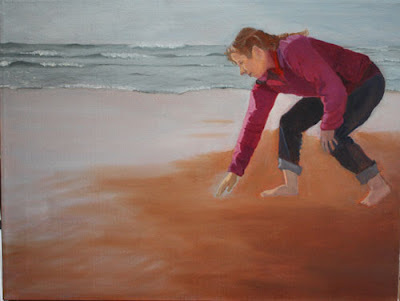 I also find more areas that need to be worked or fixed every time I come back to the easel. The time the painting is taking aside, I do love the process. It is very rewarding to see the progression even though the process can be so frustrating at times. As always, I am learning by leaps and bounds. I am not only learning the technical stuff but a lot about the philosophical process that goes into a painting. Learning all this makes me admire the painters I already admire all the more. I will talk a bit more about the details and the process once it is finished. If all goes well and to plan (I know that can be tempting fate) the painting should be finished by this Friday. It will be a week later than the time limit I set but it will still work. I will be working hard and keep my fingers crossed that I will have the finished painting to show-and-tell on my Sunday post.